A baker without an oven? Mais oui, that's exactly what I am! Maybe you've read it; my oven door fell off, so I have been not baking for almost a week and a half now. What does a girl do without an oven? Well, she buys baked treats. Which was nice for a change as well. I felt like I took a breather from baking this past week. But, like an addiction, my hands started to itch, my mouth felt dry, my stomach rumbled, and finally I couldn't take it anymore. 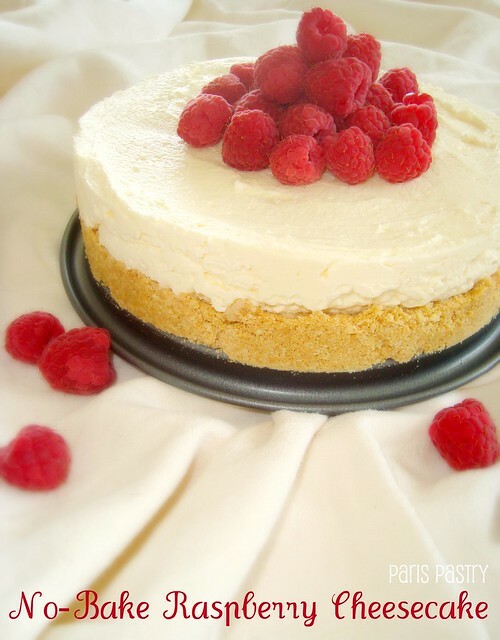 I made this easy, no-bake cheesecake topped with raspberries. 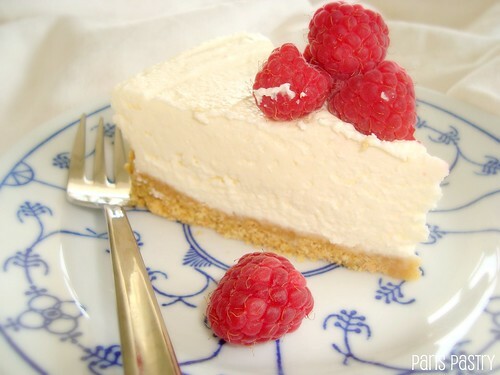 A no-bake cheesecake tastes much lighter than a baked one. Which is just as well with this unbearable heat. Plus, you don't have to turn your oven on in your cramped, too hot already kitchen. Double win! Rating: 4.5 out 5. - Blitz the biscuits in a food processor until beginning to turn to crumbs, then add the butter and whiz again to make the mixture clump. Press this mixture into a 8-inch (20cm) springform tin; press a little up the sides to form a slight ridge. - Beat together the cream cheese, icing sugar, vanilla extract and lemon juice in a bowl until smooth. Lightly whip the double cream, and then fold it into the cream cheese mixture. 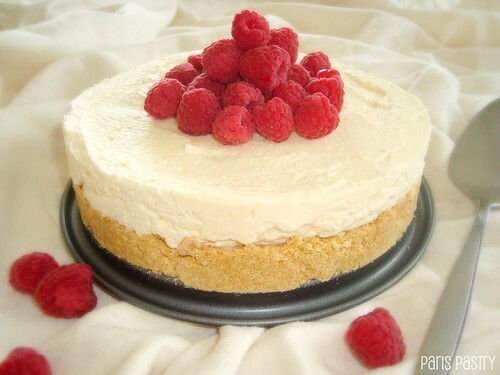 - Spoon the cheesecake filling on top of the biscuit base and smooth with a spatula. Put it in the fridge for 3 hours or overnight. When you are ready to serve the cheesecake, unmould it and arrange the raspberries in decorative fashion over the top. Thank you sooo much for sharing ... this will be a nice addition to my 4th of July menu!! see: who needs an oven anyway ;) glad it's fixed though! texture of it quite right, but with your recipe, it worked!